I love to find ways for Buddy to experience arts and crafts, especially when I can find a way to prevent the materials from going into his mouth. 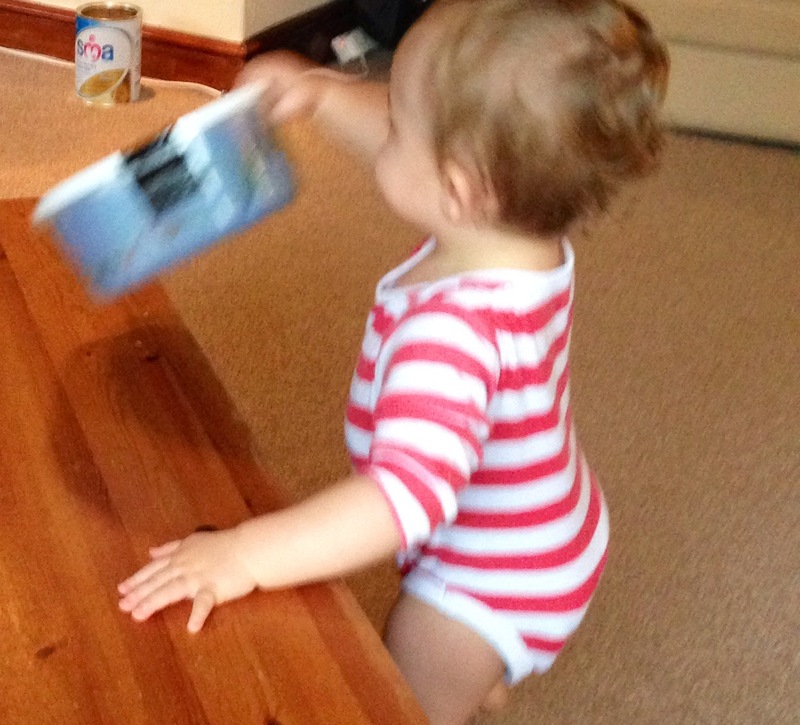 Some toddlers grow out of mouthing and tasting everything at around a year old (or even earlier) however Buddy does not seem destined to become one of them! I love some of the marble painting and ping pong ball painting ideas I have seen on Pinterest and wanted to give it a go. Unfortunately, marbles are far too edible (in Buddy’s opinion at least) and we don’t own any ping pong balls because we don’t play ping pong. Fortunately I managed to acquire these brilliant little toy capsules which lend themselves perfectly to a no mess painting activity. We picked these up in a restaurant which had a toy vending machine, these are the capsules that hold the toys. 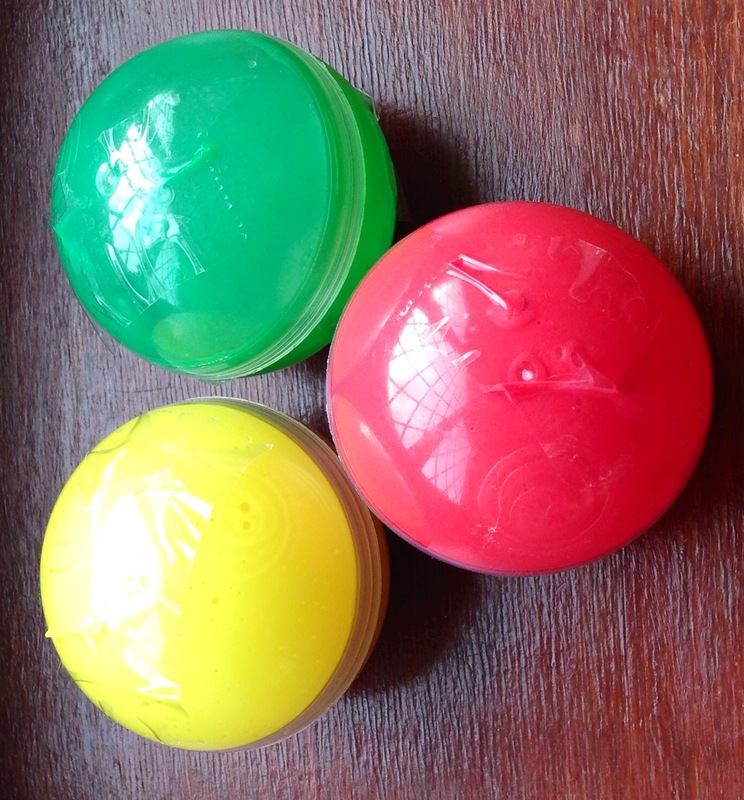 I loved that they have holes in them which meant that rather than just shaking and rolling the balls through some paint to make a pattern, Buddy could shake the balls to dispense the paint. How fun! I taped the holes at the bottom of the balls and filled each of them with a mixture of half poster paint and half water. I’m sure this would have worked with just paint, however I wanted to ensure the paint would flow easily. I taped some coloured paper to the bottom of a Tupperware container and threw the balls in (after removing the tape of course!) Buddy is quite proud of his ability to open containers so I taped the lid down to protect my carpet. Before I could even put this on the table Buddy was grabbing it. 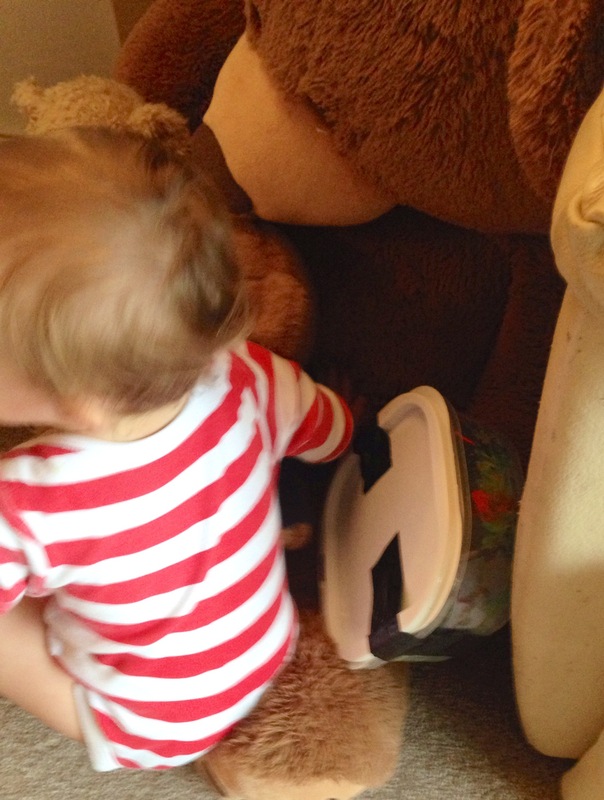 As soon as he had a good grip he took the container and went to explore it with his bears. Buddy spends a lot of time talking to his bears. I like to imagine Big Bear is the High Council (everything goes past Big Bear first), if Big Bear approves then Little Bear or Rupert usually get dragged in to play, only because Buddy can’t move Big Bear yet! 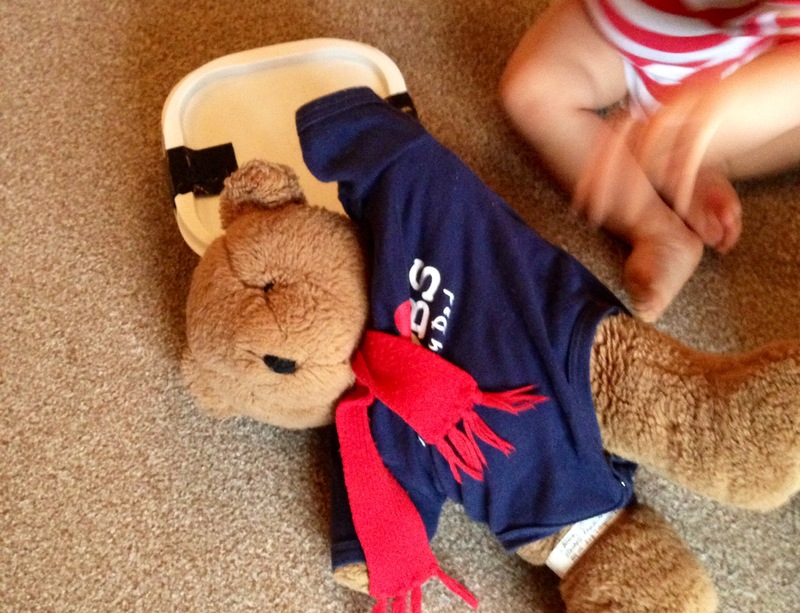 This time it was Little Bear’s turn. Buddy enjoyed shaking the box and he practiced his walking skills by taking the box on a tour of the living room (super glad I taped the lid on!) He enjoyed the rattling sound of the balls and often peered in closely to try to see them. Unfortunately by this time, most of the container was covered in paint too! We repeated this twice, with an orange paper backing and a blue paper backing. Buddy loved shaking that box and making an awesome noisy sound.Unfortunately I forgot to take a picture of the paper when I pulled it out, before I cut it up, sorry! 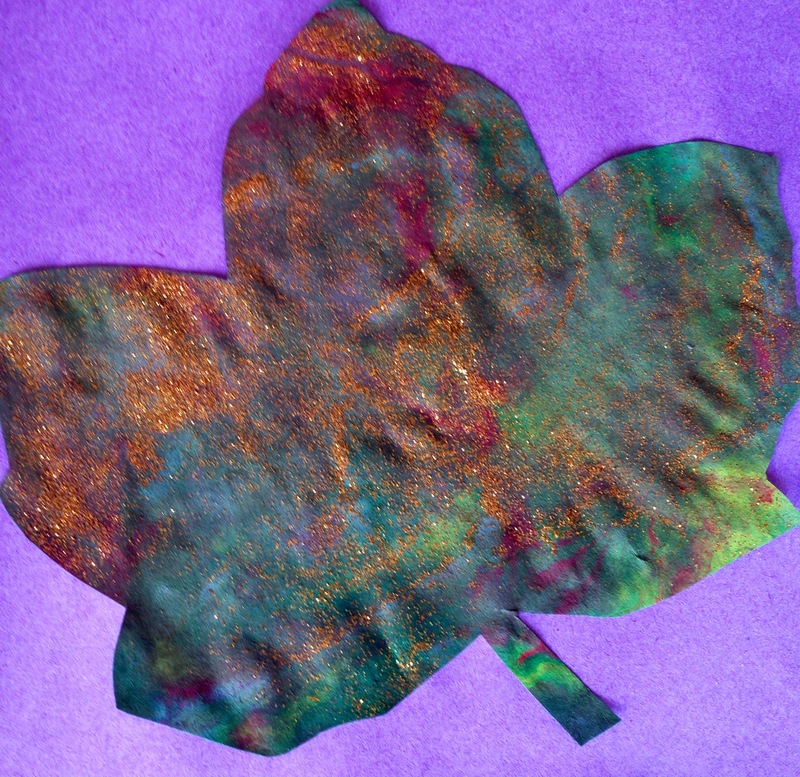 I decided to continue with our Autumn theme and cut the paper into leaf shapes. 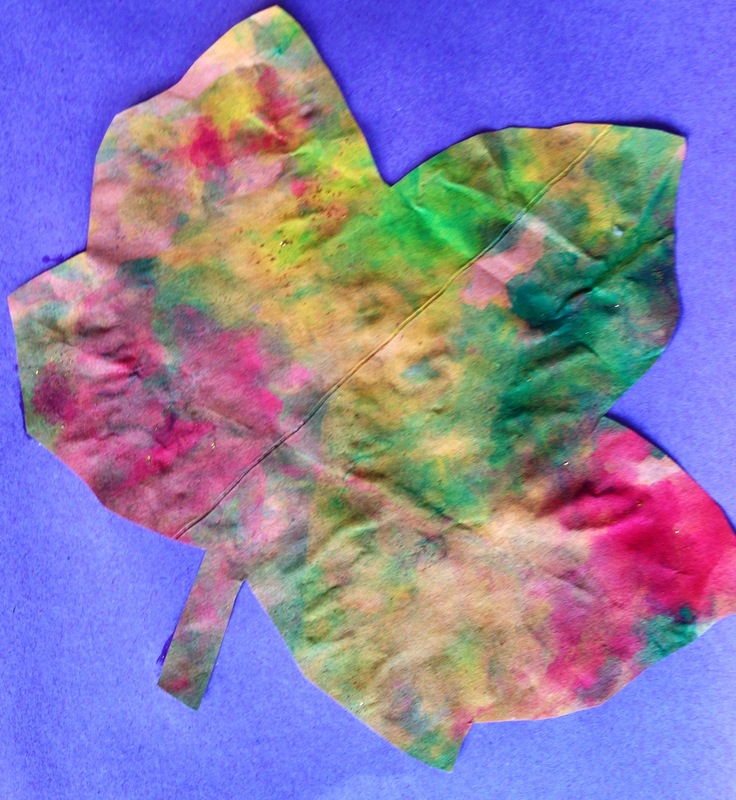 I used our Salt Dough Autumn Leaf as a template. I mounted these onto purple paper and we gave them to Buddy’s Grandma and Grandad. His first gift of artwork! Grandma and Grandad are already talking about framing it. If you enjoyed this No Mess activity you may enjoy this No Mess Salt Dough Painting activity or this No Mess Painting activity. Alternatively, if you need a bit more messy play in your life, you may enjoy this Rainbow Spaghetti Sensory Bin or this Edible Slime Play. Any comments are always welcome. Let me know what you like, what you don’t like and what you would like to see more of. I’ll do my best to oblige. 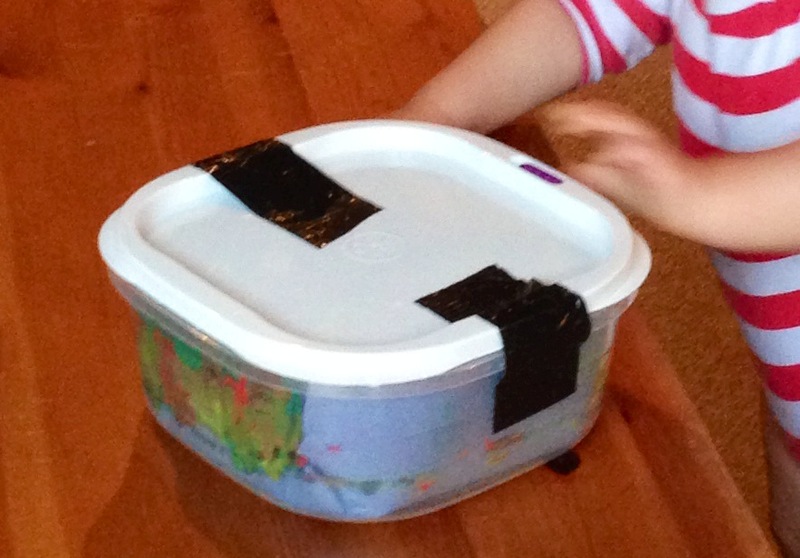 Great idea for little ones starting to explore with paint! Thanks Nicola. We had lots of fun with it! Great idea for no mess painting and sensory exploration. Thanks Karen. We love mess, but it’s always nice to have a no mess alternative! This is perfect for beginners exploring paint. Love it!